A sparkling black granite benchtop with black sinks are just two of the black elements in a bathroom where even the toilet paper is black. The dark tones complement the rust-toned tiling. Resale value is often a driving factor when renovating, especially with bathrooms, where the decision has to be made whether to have a bathtub, or not. If the bathtub and the thoughts of future owners are taken out of the equation, the possibilities are endless. 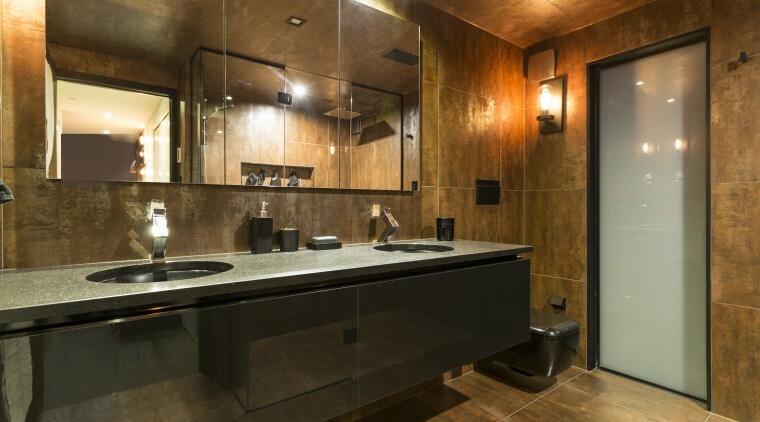 The brief to designer Hayley Dryland for this bathroom was to come up with a design that reflected the homeowners' personalities and the way they lived it also had to match the metal and black' theme of the rest of the home. "This is not a family home, this is a home designed for two people who love to entertain," says Dryland. "They already had a large spa just outside, so there was no need for a bath." The designer says that homeowners had found the tiles they wanted for themselves. 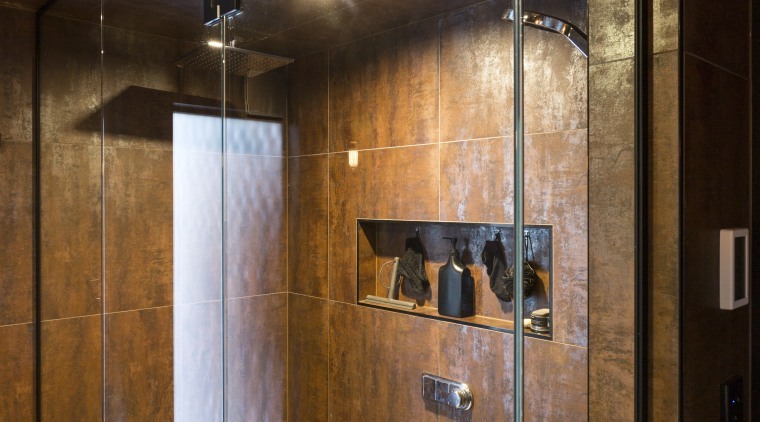 "These were large, with a rusty metallic finish, and the owners wanted the whole bathroom to be designed around them," she says. "They also wanted the ceiling tiled, to give the feeling of being inside a metal container." To bring light into this bathroom, designer Hayley Dryland installed a new floor-to-ceiling frosted window. The custom shower fittings and channel continue the black-accent theme. The shower is a microcosm of the bathroom itself. 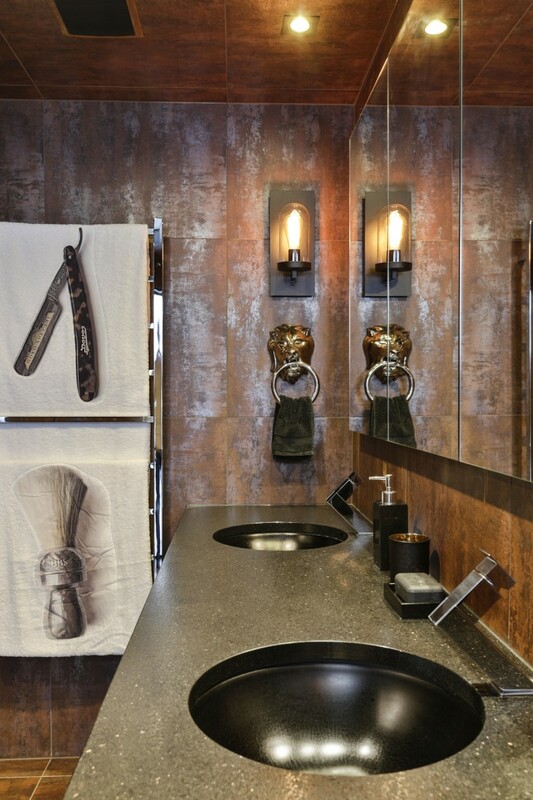 Continuing with the requested theme, the designer specified a custom double vanity in gloss black, with a slight metallic fleck running through it. The vanity top is black granite, in a leather finish, and again this has a hint of a metallic speckle to it. 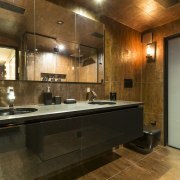 To finish the piece, the designer fitted two black under-mounted sinks, which the owners had sourced from abroad. "Originally, we picked a white toilet, but that was changed to black," says Dryland. "Even the toilet paper is black!" The whole design process was extremely collaborative, with the homeowners suggesting and sourcing many of the fixtures and finishes that give the bathroom its unique feel. One of the most unusual features is the door into the space, which has been painted with a special paint that effectively looks like it rusts. "This paint went on black," says one owner. "Then, the more coats you apply, the more it appears to rust. It's like magic." 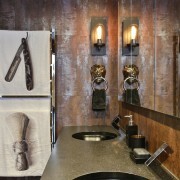 Choice of materials in this bathroom by designer Hayley Dryland contribute to the sense of drama. 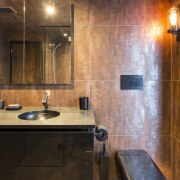 Rusty-look tiles on the walls, floors and ceiling create an enveloping feeling of being inside a metal container. A prerequisite for the homeowners was a large double walk-in shower. They wanted this to occupy the entire length of the wall, with a normal shower at one end and a rain shower at the other. To bring light into the space, the designer installed a new floor-to-ceiling frosted window, which also ensures privacy from the neighbours. Dryland also specified three recessed mirrored cabinets that occupy almost the entire width of the back wall above the vanity,. These also help reflect light around the room. Quirky finishing touches include a lions-head towel ring, bath towels embossed with old-school cut-throat razor and shaving brush, and the aforementioned, black toilet paper. Underfloor heating and a c-bus lighting system make the bathroom warm and welcoming.